1. Wash the fruit and cut a hole in the end of each one. Place them in a saucepan in a single layer, holes downwards. Place the herbs in a muslin or jelly bag and loosely tie the end. If using rosemary, snap all the shoots off about halfway down, leaving the remaining rosemary in the pot to grow again. Add to the pan with 1250ml water and bring to the boil. Simmer, covered, until the fruit is soft — about 1 hour 30 minutes. 2. Wash some jars in hot, soapy water and rinse them thoroughly. Warm them in an oven at 160°C, gas mark 3, until required. Chill a plate to test for setting. 3. Scoop the fruit from the pan with a slotted spoon and allow to cool. Pour the remaining liquid into a preserving pan, removing any stray pips. Untie the muslin bag. Warm the sugar near the oven if you can — it will dissolve more quickly. 4. Cut all the fruit into quarters, scoop out the flesh and add it, with the pips, to the herbs in the bag. Tie the bag securely and add it to the preserving pan. Finely shred the peel and add it with the sugar to the pan. 5. Bring the marmalade to the boil, stirring until the sugar has dissolved. Boil rapidly until setting point is reached, in about 30 minutes. Stir the marmalade occasionally. When the liquid starts to leave the wooden spoon in flakes rather than drips, it's time to test for setting point. Spoon a little onto the chilled plate and leave for about a minute. Push it with your nail — if it wrinkles, it's ready. If not, continue boiling then test again. Remove the pan from the heat once setting point is reached. Scoop out the muslin bag, pressing out as much juice as possible. 6. Leave the marmalade for 20 minutes before bottling, to avoid the peel rising in the jars. Any foam that formed during boiling should disappear. If any remains when you are ready to bottle, skim it off with a spoon, or add a few flakes of cold butter and stir, which disperses it. 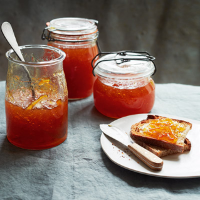 Pour the marmalade carefully into the clean, hot jars. Seal, and label when cold.